Nanoparticle waterproofing is quickly helping us gain ground in our ever constant struggle to combat the elements while riding. Castelli's Women's Nanoflex Donna Tight combines their water-shedding Nanoflex fabric with a minimal seam construction to tighten your defense against wet weather. GIRO3 ankle grippers are designed to seal around your shoe covers, but YKK® camlock ankle zips still make these tights easy to get on and off. A KISS Air seat pad offers all day comfort with its anatomic shape and continuously variable thickness for natural-feeling contours. Thanks to this product, I venture forth on days below forty with far more frequency! Great fit. Love the comfy waistband and gripper ankles which add to wind protection! Have used them in the fall weather of Montana. and just returned form Cycling in Ireland great in the rain, mist, wind that is Irelands weather. Very comfortable and definitely kept me warm and dry in the all day rain and mist. These are great tights for cold temps. The chamois is very comfortable as is the overall fit. The leg length works well for me (size Small isn't too long on my 5'2 frame). 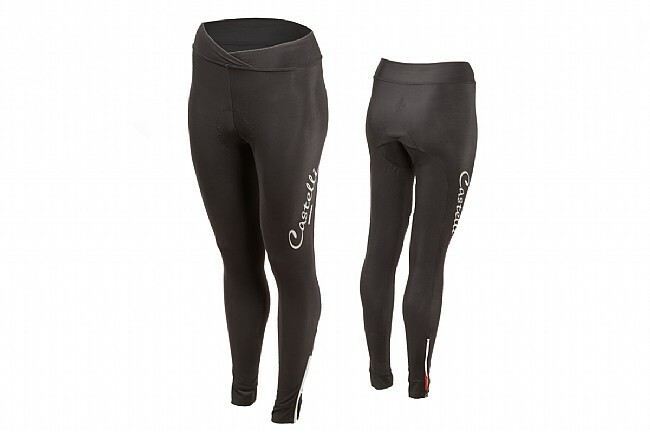 They are not thick like Castelli's Meno wind bib tights (which are super awesome for really cold rides!) but still provide nice warmth and comfort on cold rides. One great feature with no bibs is not having to get half undressed to make a nature call, which is particularly nice in cold weather! Order came fast and love the fit.... true to size. Keep my legs warm.